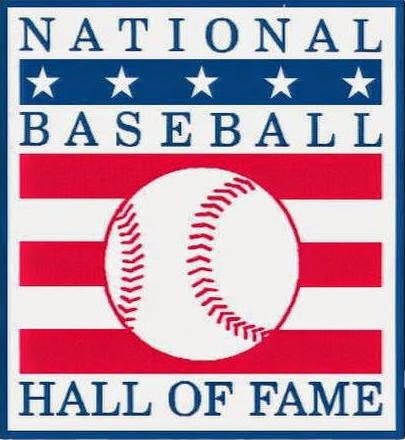 As you know by now, Pedro Martinez, Randy Johnson, Craig Biggio and John Smoltz have been elected to the 2015 Class of the Baseball Hall of Fame. Congrats! Not a bad pick in the bunch. Go here to check out the BBWAA story and below is the tally for all players receiving at least 50% of the vote. 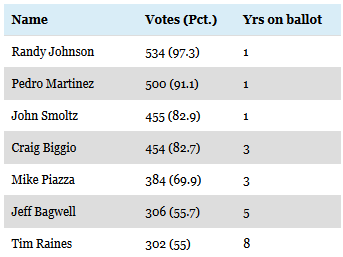 Unfortunately, Mike Piazza missed the cut by the smallest of margins - 28 votes. He received 384 votes for a 69.9%. Entry required 75% of the vote. I suspect he'll cross that bridge next season. I also wanted to make note of the induction of Pedro Martinez. 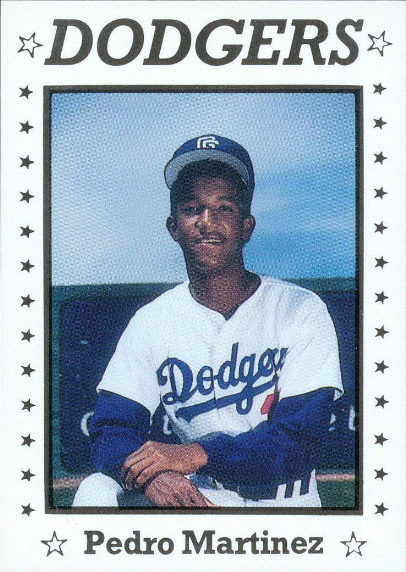 As you know, he began his professional career as a Dodger, but was traded away in 1993. Being the younger brother of then staff ace Ramon Martinez, it would've been nice to see the duo pitch together for most of their careers. Instead, Dodger fans are left to ponder what could have been. Since his rookie cards all feature him in Dodger Blue I thought I would share pics of them all; including minor league cards. Check them out below. Blog Kiosk: 1/6/2014 - Dodger Links - Anderson's Contract Info, Ryu's Newest Commercial and the Legacy of "The Brow"
Featured above is a photo of Tommy Lasorda with Lindsay Berra, granddaughter of Yogi Berra. It was tweeted by Lindsay this morning. She explains that she isn't angrily pointing at Tommy, like the photo seems to suggest. Instead, she is telling an animated story about her grandfather and Joe DiMaggio. Unfortunately, she doesn't provide any details about the tale... But ya know, it's gotta be a good one. Here's and AMA ('Ask Me Anything') announcement that might interest some of you. JP Hoornstra, who covers the Dodgers for the Los Angeles Sports Group, will participate in an AMA on Thursday, January 8 at noon PST. Go here for information. Via Ken Gurnick at MLB.com, "Mattingly enters final year of HOF eligibility." "I don't think I'm a Hall of Famer," Mattingly has said. "I don't think I have the numbers. Part of it is longevity, and I wasn't able to do that and do the things that I did early in my career. The Hall of Fame would be a great honor, but I don't live my life based on whether or not that will ever happen. So in the grand scheme of things, it's not that important." Via an AP repot at ESPN LA, "(Brett) Anderson's deal includes $5 million signing bonus." The 26-year-old left-hander, whose deal was completed last week, is due half the signing bonus on Jan. 15 and the rest on Feb. 15. He receives a $5 million salary and can earn bonuses based on innings pitched: $300,000 each for 150 and 155; $350,000 apiece for 160, 165, 170 and 175; and $400,000 each for 180, 185, 190, 195 and 200. Via Eric Stephen at True Blue LA, "Salary arbitration preview 2015: Chris Heisey." This is an excellent report on Friedman's tendencies and Heisey's case for a raise. Via Rich Klein at Sports Collectors Daily, "Ramblings: Sloppy Signatures and the Brooklyn Dodgers’ Clubhouse Signer." The other fascinating part was comparing the percentage of good Munson signatures to the Brooklyn Dodgers of the 1950's. “Dem Bums” had a clubhouse man named Charles di Giovanni. I remember reading a long time ago in Sandy Koufax' 1966 autobiography that he could sign the Dodgers’ names better than the Dodgers themselves. Today, when you hear about secretarial signatures on those balls, there’s a good chance they were penned by Charlie D. And he was so good that even players could end up with baseballs he signed. BTW, PSA/DNA has a good article discussing the work of Charles "The Brow" DiGiovanni that you can check out here.